More than 34 millions people went to see this adventure inside the human body and finally it is arrived in Rome. Body Worlds is the original anatomical exhibition series displaying authentic human bodies, willed by donors through the Institute for Plastination’s Body Donor Program! 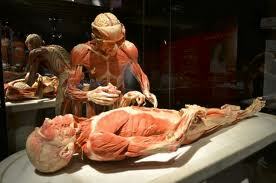 They are preserved using a process called plastination invented by Dr. von Hagens. Real human parts are preserved through the science of plastination and show the human body in real-life poses, like never seen before. Body Worlds – Il vero mondo del corpo umano is in Rome from 14 settembre 2011 up to 15 february 2012 for the first time in Italy at Officine Farneto, close to Stadio Olimpico. is a man shaped by extraordinary events: as we read in the main siteGunther von Hagens of the Body Worlds: “two year imprisonment by East German authorities for political reasons, his release after a $20,000 payment by the West German government, his pioneering invention of plastination that halts decomposition of the body after death and preserves it for didactic purpose, his collaboration with donors including his best friend, who willed and entrusted their bodies to him for dissection and public display, and his role as a teacher carrying on the tradition of Renaissance anatomists”. Gunther von Hagens’ Body Worlds exhibitions are showing in America, Europe and Asia and finally in Italy. If you are visiting this beautiful city, you should go and check it! This entry was posted on Friday, January 13th, 2012 at 5:22 pm	and is filed under Events in Italy. You can follow any responses to this entry through the RSS 2.0 feed. You can leave a response, or trackback from your own site.